Those most affected by the hurricanes will need support for some time. Donations to the Red Cross, Salvation Army, and local food banks are a great way to help. We also recommend donating to the Fuel Relief Fund (FRF). FRF is focused on solving fuel crises in disaster situations, providing free fuel to first responders, people in crisis, and the relief agencies that serve them. FRF is currently providing fuel relief efforts in Houston and South Florida. As events unfold, we have been closely monitoring the refinery outages and restarts and their impacts on refined products supply. Hurricane Harvey landed right in the middle of the largest fuel refining and distribution center in the U.S. The hurricane has left its mark on area refineries, fuel terminals, storage tanks, pipelines, and ports for the import and export of fuel. Texas refineries account for 31% of total U.S. refining capacity. Refineries in Houston, Corpus Christi, Beaumont, and Port Arthur shut down or slowed down due to flooding, reducing refining capacity by 2.2 million barrels per day (bpd). According to the EIA, for the week of September 1st, outages and reduced runs due to the hurricane resulted in PADD 3 refinery utilization falling from 96% to 63%. Currently, most refineries are back up, but running at reduced capacity. The largest refinery in the country, Motiva’s 603,000 bpd Port Arthur refinery restarted on September 11th with a goal of running at 40% capacity. Only Exxon Mobil’s Beaumont refinery and Total’s Port Arthur refinery are still shut down. Gulf Coast refineries supply refined products to the East Coast, Midwest, and export internationally. Markets in the East Coast and Midwest are supplied by pipeline, the largest being the Colonial Pipeline. The Colonial Pipeline runs 5,500 miles from Houston to New York Harbor and carries 2.5 mbd of gasoline, diesel, and jet fuel. With production from the refineries cut off, Colonial curtailed operations. Continuous operations at reduced rates were restored on September 6th. Because of reduced supply capabilities, gasoline inventories fell 8.4 million barrels during the week of September 4th, the largest draw on record. States supplied by Colonial like Tennessee, Georgia, South Carolina, and North Carolina, have seen gasoline prices spike as a result of the supply constraints. Florida is unique because it does not have a pipeline system. Florida’s refined products are supplied by tanker deliveries from the Texas Gulf Coast to the ports of Jacksonville, Tampa, and Miami. Due to the hurricanes, those supplies are now coming from New York Harbor. In order to hasten supply to ports in the Southeast, the Department of Homeland Security has issued a Jones Act Waiver in effect until September 22nd, allowing foreign-flagged vessels to deliver products between U.S. Ports. The disruption from Hurricane Harvey has also impacted export volumes. According to their latest Short Term Energy Outlook (STEO), EIA expects net petroleum product exports to fall by an average of 1.1 million bpd in September, down from an average of 2.9 million bpd during the first eight months of 2017. Countries like Mexico, who rely on petroleum product imports from the U.S. Gulf Coast, will have to look farther afield for supply. Mexico relies on Texas refineries for about 80% of its gasoline; in the days following damage and flooding in Texas from Hurricane Harvey, however, they have been forced to look to other sources. According to our sources in Mexico, as of a week post-storm, Mexico’s state-owned petroleum company (Pemex) had imported over 2 million barrels of fuel from places as far away as Europe and Singapore. They had also increased buying from other areas of the U.S. unaffected by the storm, as well as from Canada and Brazil. Mexico’s ability to fill demand after the hurricane has left retail prices relatively stable. Since Hurricane Harvey hit Texas on August 25th, retail gasoline prices have increased about 1.6% from $17.44 MXN per liter ($3.71 per gallon) on August 21st to $17.72 MXN per liter ($3.77 per gallon) on September 11th. 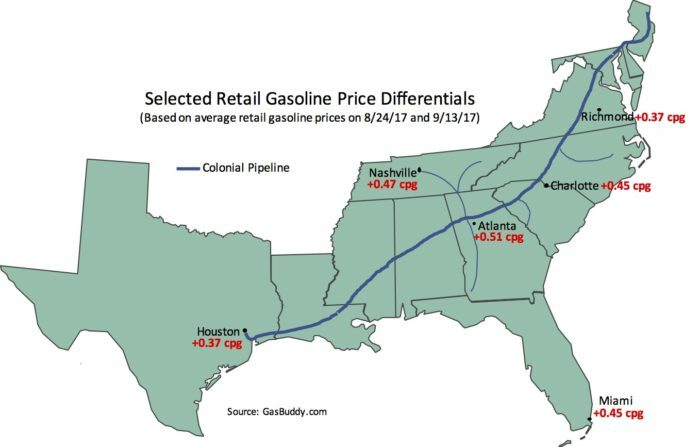 We’ll be paying close attention to retail price changes as the Gulf Coast recovers from the hurricanes. Please let us know if you have any thoughts or questions about the impacts to refined product supply and distribution.